EQE of semiconducting polymer (P3HT) as a function of illumination position between coplanar metal electrodes. 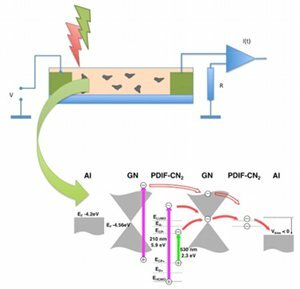 We have performed a systematic study of dependence of time-resolved photocurrent on the point of charge excitation within the organic semiconductor channel formed by two coplanar metal electrodes. The results confirm that spatial variation of electric field between the electrodes crucially determines transport of photogenerated charge carriers through the organic layer. 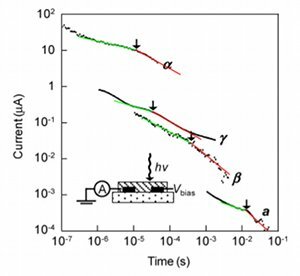 Time-of-flight measurements of photocurrent demonstrate that the transit time of photogenerated charge carrier packets drifting between the two electrodes decreases with increasing travelling distance. Such counterintuitive result cannot be reconciled with the spatial distribution of electric field between coplanar electrodes, alone. It is also in contrast to expected role of space-charge screening of external electric field. Supported by Monte Carlo simulations of hopping transport in disordered organic semiconductor layer, we submit that the space-charge screens the external electric field and captures slower charge carriers from the photogenerated charge carrier packet. The remaining faster carriers, exhibit velocity distribution with significantly higher mean value and shorter transit time. 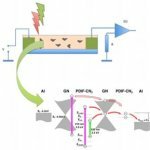 The work is published in Organic Electronics. On 25th of July 2016, the prestigious international journal Nature Nanotechnology has published an article by an international group of scientists from the University of Strasbourg (France) and the University of Nova Gorica (Slovenia). The article presents the results of an experimental study of a novel two dimensional nanostructured photo-sensor. 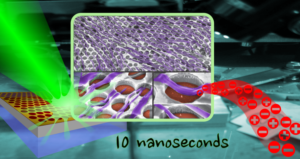 The photo-sensor comprises two-dimensionally aligned semiconducting polymer nanowires, which results to be highly efficient system for the detection of the visible light. This discovery opens the door to the development of fast light photo-sensors, which will be entirely made of organic materials. The sensors exhibit response times below 10 ns and extremely high signal to noise ratios. More can be found here or here (in slovenian language). 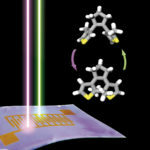 Researchers from the University of Nova Gorica (Slovenia), University of Strasbourg & CNRS (France) and the Humboldt University of Berlin (Germany) have shown that a carefully chosen blend of a small photoswitchable molecule and a semiconducting polymer can be used to fabricate high-performance memory devices that can be written and erased by light. Such multilevel (8-bit!) optical memories have also been implemented on flexible substrates, paving the way to applications in wearable electronics, E-papers, and smart devices. 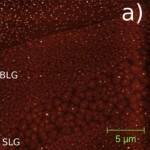 These results have been published in Nature Nanotechnology. Our researchers with collaboration of colleagues from MRL laboratory and IJS scientists, found a novel and efficient method used to improve carrier mobilities of poly(3-hexylthiophene) (P3HT)-based organic field effect transistors by means of nanowire formation. The treatment, termed solvation, consists of depositing a small quantity of a solvent directly on top of a previously deposited semiconducting film, and allowing the solvent to evaporate slowly. Such treatment results in an increase of the saturation mobility by more than one order of magnitude, from 1.3 × 10−3 up to 3.4 × 10−2 cm2/Vs, while devices preserve their high ON/OFF ratio of ∼104. The atomic force and scanning electron microscopy studies show that solvated P3HT layers develop a network of nanowires, which exhibit increased degree of structural order, as demonstrated by micro Raman spectroscopy. The time-of-flight photoconductivity studies suggest that higher hole mobility stems from a reduced energy disorder of the transporting states in these structures. More can be found in this paper. Schematic representation of graphene templating of organic transistor with small molecules or polymer. Atomic force microscopy has been used to examine early stages of pentacene growth on exfoliated single-layer graphene transferred to SiO2 substrates. We have observed 2D growth with mean height of 1.5 ± 0.2 nm on as-transferred graphene. Three-dimensional islands of pentacene with an average height of 11 ± 2 nm were observed on graphene that was annealed at 350 °C prior to pentacene growth. 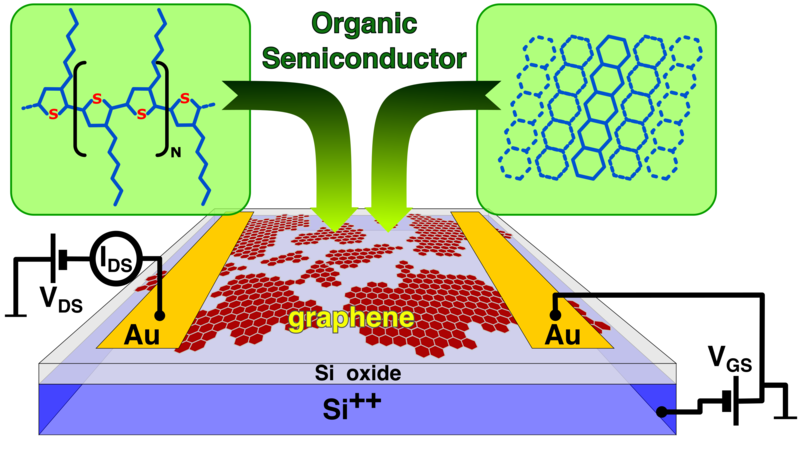 Compellingly similar 3D morphology has been observed on graphene transferred onto SiO2 that was treated with hexamethyldisilazane prior to the transfer of graphene. 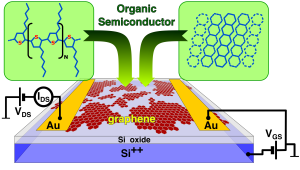 On multilayer graphene we have observed 2D growth, regardless of the treatment of SiO2. We interpret this behavior of pentacene molecules in terms of the influence of the dipolar field that emerges from the water monolayer at the graphene/SiO2 interface on the surface energy of graphene. 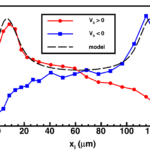 This work was published in Langmuir. Schematic view of photocurrent dynamics in composite layers. In collaboration with the University of Strasbourg and ISOF-CNR Bologna, Italy, our group published results of a study of graphene/organic semiconductor composites. 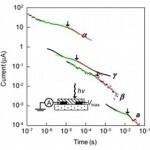 Organic thin-film transistor transfer characteristics and time-of-flight (TOF) photoconductivity measurements were used to investigate the effect of the addition of liquid-phase exfoliated graphene nanoflakes (GNs) on the electron mobility in thin films of N,N’-1H,1H-perfluorobutyl dicyanoperylene-carboxydi-imide (PDIF-CN2). Transfer characteristics measurements reveal that the charge carrier mobility of PDIF-CN2 increases by almost three orders of magnitude via blending with GNs. TOF photocurrent measurements confirm that the GNs improve the charge carrier transport in PDIF-CN2. We have found a strong dependence of the TOF-determined electron mobility on the excitation wavelength and obtained a maximum mobility of 0.17 cm2/Vs for charge carriers produced in GN: PDIF-CN2 blends, using photon energy of 5.9 eV. 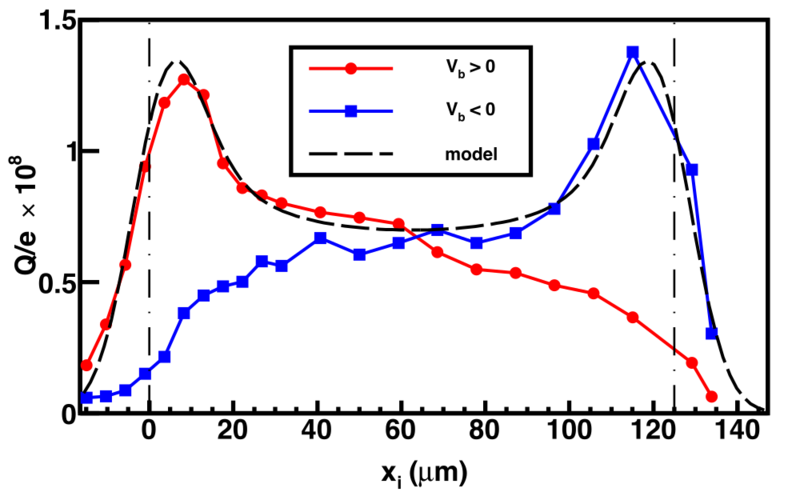 This value is in good agreement with the field-effect mobility of 0.2 cm2/Vs determined from data recorded in the low-voltage region of transfer characteristics. More information can be found in the article. Time-of-flight photoconductivity measurements of four different phases of TES-ADT material. Together with Imperial College, Holst Centre, ICMM Madrid, University of Kentucky and ETH Zürich we have been investigating electric transport properties of 5,11-bis(triethylsilylethynyl) anthradithiophene (TES ADT). TES ADT– one of the most promising, solution-processable small-molecular organic semiconductors – was analyzed, revealing the highest performing polymorph among four solid-state phases, opening pathways toward the reliable fabrication of high-performance bottom-gate/bottom-contact transistors. The results are published in Chemistry of Materials. Graphene is the material of the future. Our group in collaboration with Serbian partners have examined the effects of transfer residue and sample annealing on the optical properties of chemical vapor deposited graphene, transferred onto a sapphire substrate. The optical absorption of graphene was obtained from point-by-point inversion of spectroscopic ellipsometry measurements in the visible and ultraviolet ranges (250-800nm). Measured spectra were analyzed by optical models based on the Fresnel coefficient equations. The optical models were supported by correlated Raman, scanning electron microscopy, and atomic force microscopy measurements. The obtained data were phenomenologically described by a Fano model. The results show that a residue layer left on graphene can significantly increase its optical absorption in the visible range, compared to an annealed sample. These results were published in the paper.